The weather was superb for our sports day in June, with the croquet players and golfers enjoying a relaxed yet competitive morning. With more beginners luck than judgement, myself and Jenny Dyer from my office, bumbled our way through to become this years champions of the croquet lawn. The golf was won by Robert Ward of RBS and our congratulations to you Robert. I am so pleased that the sports events and luncheon were well attended and that members and guests enjoyed the day. 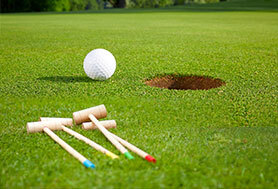 We had the maximum amount of croquet players that can be accommodated so please remember to book early for next year. Our speaker on the day was Martin Dock who also taught and adjudicated the croquet in the morning. It was fascinating to learn of the many different types of games, strategies and shots that can be played in a match that appears so gentle but that can be so ‘vicious’, as he puts it. I am sure that the members and guests who did not participate still enjoyed his banter and old English charm, as he took us through the game’s history with his talk. Bob Sharpe will provide our talk this month. Having been a librarian for 40 years, 30 in Hertfordshire and 10 in Dorset, Bob retired nearly 5 years ago. As a national literary crime award judge, his talk will explain how he got into the world of crime writers and then give the history of fiction crime novelists from 1800 until 1945. July’s meeting will be the last one before I pass on the heavy chain to Luzia Holloway. 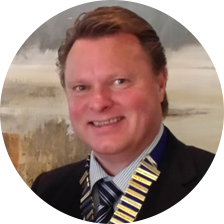 I would like to take this opportunity to say how much I have enjoyed being the Associations chairman over the last year and thank all members for their support. There have been many new business acquaintances made through the networking of the members and their guests this year, and I hope that they lead to increased business for all of us. I know that Luzia will look to increase membership and will take on the Chairmanship role with her usual exuberance and flair. I am sure that she will be well supported. In the meantime we have a break, as there is no meeting in August, and I hope that you all enjoy your Summer holidays. This entry was posted in News on July 7, 2015 by splice.